We have two take-offs, one at 700m and the other at 1000m altitude. Depending on the weather conditions we will use one or the other. At the takeoff our instructors will equip you with the harness and helmet and explain what the takeoff consists of. You will be informed at all times so that you have a wonderful experience. 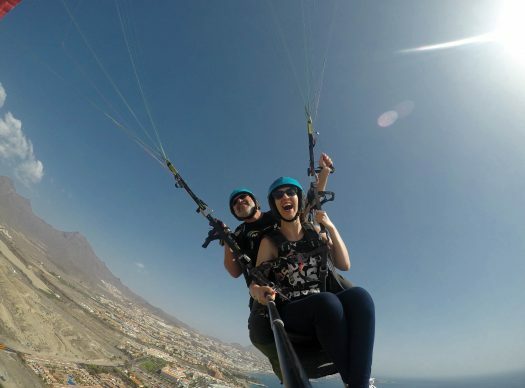 Once you take off, the experience will be comfortable as you will find yourself comfortably seated in a safe harness. The pilot will be able to show you the different views that can be seen from this flight, such as Barranco del Infierno, Roque del Conde and Playa de las Américas. At the last part of the flight the pilot will do a performance that consist of wingovers and deep spiral where we descend until the landing place. Beginner. It will be very easy, just follow the instructions of your instructor and you will be flying in an instant. The duration of the flight is between 15 and 20 minutes but you will need 2 hours of time in total for the experience including transportation. We can collect you from your hotel if you are in the south of the island or, if you prefer, you can come to the meeting point at Enramada beach, Costa Adeje. We normally land on Playa de la Enramada, Costa Adeje, but depending on the weather conditions, the pilot may choose to land at other official locations.